This is the collection of other Transputer interface cards (i.e. not from the usual suspects) I came by here and there. And no, I don’t actually own them all. In constant search of raw computing power they tried out everything, eg. Intels i860 and others. It was just another logical step to try speeding-up Pixars Renderman package by using a Transputer farm. As an early adopter, they had to build their own stuff to suit their demands. Here’s a very interesting read about the long way Renderman came from and which hardware they’re were using. This article about texturing techniques is mentioning this card on pp.16. The mentioned Jeffrey Mock was also quite busy during his Pixar days in helping Logical Systems (LSC) by writing a concurrency library for their C-Compiler. 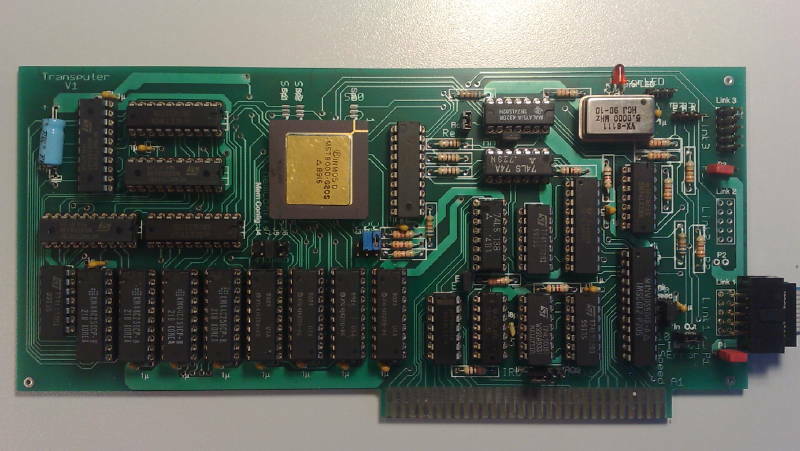 Here’s the front of the full-size 8bit ISA card – filled up to the brim. It features two T800-20 Transputers, each having its own 4MB of RAM. Two links are facing the outside-world – I presume it’s been meant like a up- and down-link to the next card. The rest is standard early-days ISA bus, C012, Transputer DRAM design. No much to say about the back side. The silkscreen is a bit uncommon, but it’s nice when it comes down to repairing… and some “burning” shows, that seemed to be the case with this specific card. 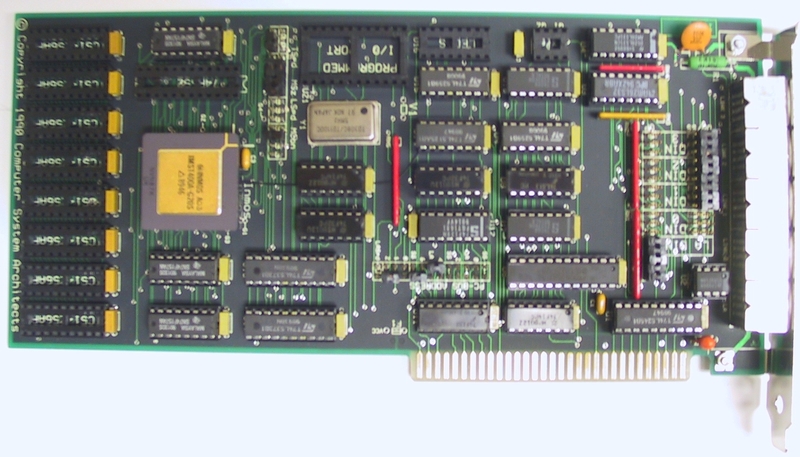 This is a fullsize 16-bit ISA card from YARC. It features 4 Transputers with the option of supporting them with a (for the time) big amount of RAM. The ProTran board can be equipped with 1 to 4 Transputers. The root Transputer (the rightmost) can have acces to 1-16 megabytes of RAM – it’s 8 in this picture. Each of the other three can be configured with 1 to 8 MB. That was very serious stuff back then. All links, event inputs and subsystem control signals are fed to a proprietary pin-field array. All this explains the excessive use of GALs in the lower half of the card. Beside the proprietary approach the ProTran offered a compatibility mode (read: B004 interface) to use standard INMOS tools. CSA (Computer Systems Architects) was big in the educational market and produced smaller, better integrated B004 compatible Transputer cards. 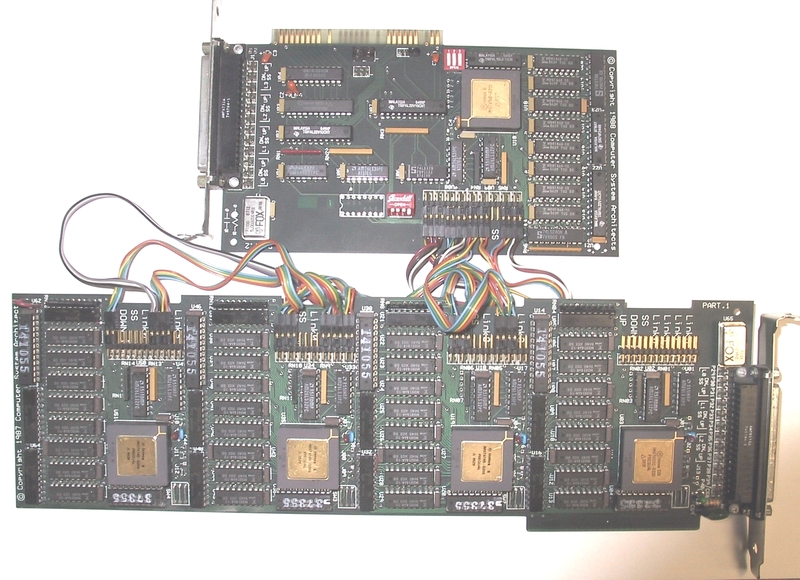 The higher integration of DRAM parts allowed half-length ISA cards meant for evaluation or as a starting point for building bigger systems later. 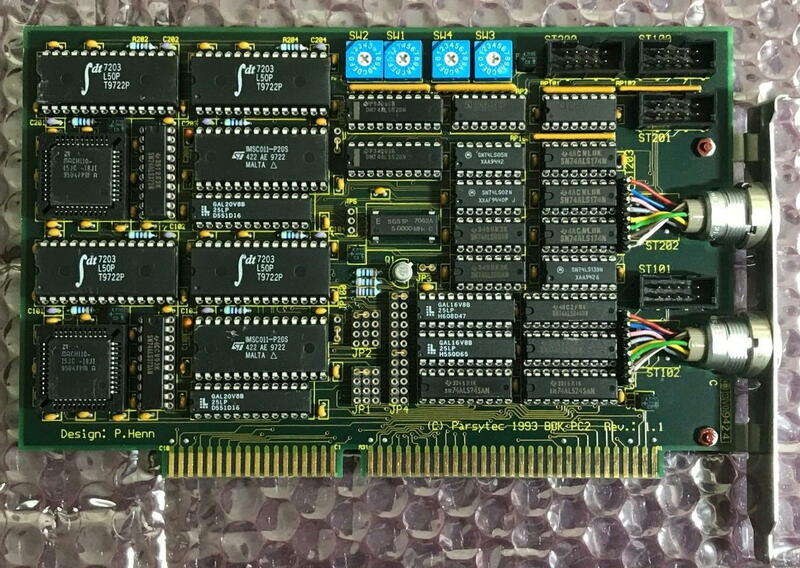 This is th PART.1 four processor board – mainly a carrier for CSAs proprietary Transputer Modules (like INMOS’ TRAMs), and the single processor PART.2 board featuring a PC interface. Very simple design but only 2 layers and completely documented in the book. As ususal, Parsytec did things a bit different than most others. Like the HEMA card, this one has SRAM buffers, too. Also it looks like it’s using a 16-bit interface to the ISA bus. Can you help me ID it? Hit me with email if possible. This seems to be an unknown, early Transputer card from “Micropar Inc.” simply called “T4” (Rev 1A) – that’s all taken from the last picture of yours. Each Transputer has 4 (pretty slow) SIPP RAM modules totaling in 1MB per T.
At the far right, an IMSC012 hints towards a B004 compatible bus interface – so give ispy a try. The empty space for an Motorola 68230 parallel interface/timer is interesting and a first for me. Never saw that in a Transputer design.